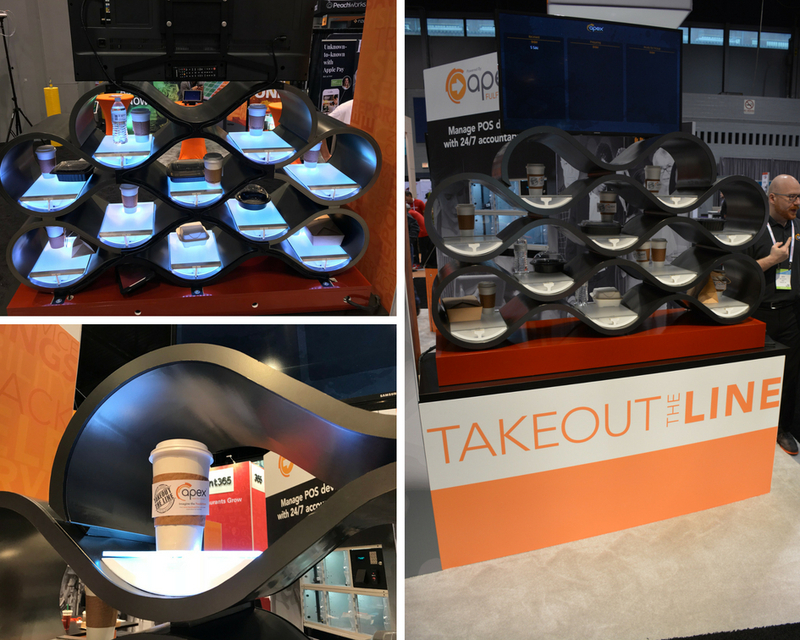 CHICAGO, IL – May 22, 2018 – With its new Smart Shelf™ concept, Apex Order Pick-Up Technologies™ is taking a radically different approach to the design of self-serve order pickup solutions. This frictionless order pick-up technology is on display at the 2018 National Restaurant Association (NRA) Show where attendees visiting Apex at booth 5870 can see the forward-thinking concept firsthand and provide feedback before the technology is commercially available. In fact, the concept’s sleek, futuristic design is intended to pique the imagination of NRA attendees and stimulate discussion. Apex is seeking feedback on the fast, easy frictionless approach to order pickup and the aesthetic design preferences of different users and how the system can be designed to support their needs. Without doors to secure each shelf cubby, the Smart Shelf is designed for QSRs with rapid order turnover where controlled access is not needed. It relies on patent-pending technology from Apex and Bluetooth Low Energy (BLE) activated sensors to make order pick-up even faster and easier while providing a more aesthetically-pleasing endpoint for the order ahead process. Customers are notified their order is ready through their app. Upon arriving at the store, they will approach the device. The Smart Shelf’s BLE beacon identifies them when they are in proximity of the device. This triggers the customer’s name and order location on the device’s display as the shelf cubby with their order lights up. The customer simply picks up their order and can enjoy their food or beverage. Absolutely no lines or waiting is required. And the customer doesn’t have to directly interact with the Smart Shelf as long as their smartphone app is running. If someone grabs a different order by mistake, the device can use visual and audio cues to alert them. The Apex Smart Shelf concept is being developed to integrate easily with a restaurant’s existing infrastructure – including point of sale (POS), kitchen display systems (KDS) and mobile apps. The device will be available in custom designs and configurations, tailored to the requirements and design standards of a particular brand. Discover how Apex Order Pick-Up Technologies is #FiredUp to help restaurant and foodservice brands takeout the line during the NRA Show at booth 5870 or online. And to follow our coverage of the NRA Show, look for #NRAShow across our LinkedIn and Twitter feeds. Apex Order Pick-Up Technologies is the world’s leading provider of self-serve automation for use in retail, restaurants and the foodservice industries. Our solutions takeout the line to help our customers provide a fast, no-wait experience. With world headquarters in Mason, Ohio, Apex has offices in Australia, Germany, Poland, the UK and Latin America. To learn more about Apex, visit us online at https://www.apexsupplychain.com/Foodservice.